Next year, 2019, is the the tercentenary celebration of the death of Saint John Baptist De La Salle. Join the 2nd One La Salle Alumni Congress as all Lasallian alumni will get together to celebrate on June 26-29, 2019 at University of St. La Salle Bacolod City, Negros Occidental. 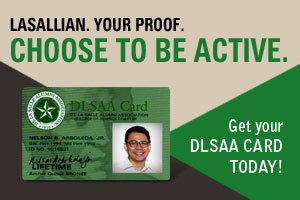 Contact the USLS Alumni Association Bacolod Inc. now! Early bird registration is at P3,000.00.